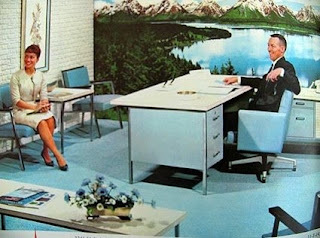 Since I got my sinfully scarlet Steelcase chairs last week I've been coming across the American manufacturer's modernist office furniture everywhere. 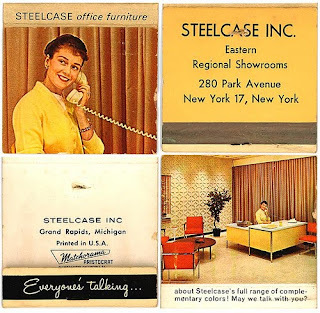 Founded in 1912 as the Metal Office Furniture Company, Steelcase got its new name at the height of the mid-century modern movement. Their website doesn't have much information about the designs from the 1950s, 60 and 70s but a few evocative photos can be found at the milestones section. or this yellow chrome armchair, from the early 1960s. 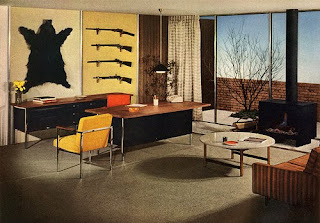 (If you are hungry for more MCM images the Mid-Century Modernist has a post here). 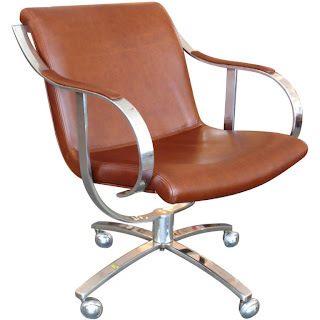 Of course actual examples of Steelcase MCM furniture often come up for auction, on ebay, or at 1stdibs. 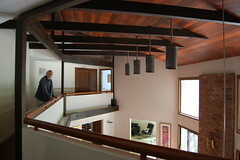 Prices vary widely - as does the condition of the furniture. 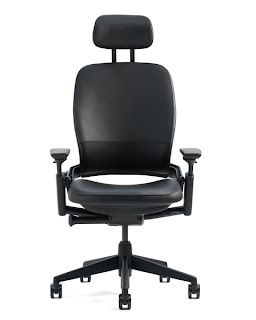 And if you prefer your work space modern rather than modernist, The Steelcase Design Studio is still producing solid, ergodynamic office furniture. For more info on new products visit their blog. I think I'm in love with those catalog photos! As much as the sassy secies steal my heart, the rifles and bear skin really do say something about that office's occupant, huh? He's probably in the closet, bless his little macho wannabe heart. I wonder if it would be different if the bearskin was on the floor? Probably not.... There are four rifles on the wall after all!